The Hill.com reported Tuesday the Senate Judiciary Committee has launched a full-scale probe into a Russian nuclear bribery case, demanding federal agencies disclose if they knew the FBI had uncovered corruption before 2010 when the Obama administration approved a controversial uranium deal with Moscow. The Hill.com notes Sen. Chuck Grassley (R-Iowa), the committee chairman, gets his first chance to raise the issue in public on Wednesday when he questions Attorney General Jeff Sessions during an oversight hearing. 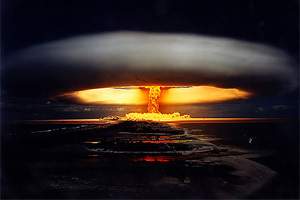 “Though the hearing was scheduled for other purposes, aides said they expected Grassley to ask Sessions questions about a story published in The Hill on Tuesday that disclosed the FBI had uncovered evidence showing Russian nuclear officials were engaged in a racketeering scheme involving bribes, kickbacks and money laundering designed to expand Russian President Vladimir Putin’s atomic energy business on U.S. soil. “The evidence was first gathered in 2009 and 2010 but Department of Justice officials waited until 2014 to bring any charges. 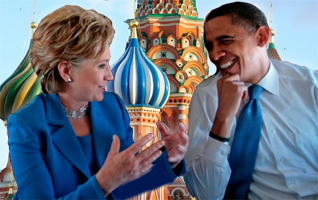 In between that time, President Obama’s multi-agency Committee on Foreign Investment in the United States (CFIUS) gave approval to Russia’s Rosatom to buy a Canadian mining company called Uranium One that controlled 20 percent of America’s uranium deposits. 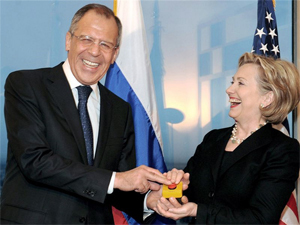 Then-Secretary of State Hillary Clinton handed mock ‘reset’ button to Russian Foreign Minister Sergei Lavrov in Geneva in 2009. “The committee’s members at the time included former Attorney General Eric Holder and former Secretary of State Hillary Clinton, whose husband collected large speech fees and millions in charitable donations from Russia and other entities interested in the outcome of the decision. “Grassley dispatched letters late week to all the federal agencies whose executives served on the CFIUS when the decision was made, demanding to know whether they were aware of the FBI case before they voted,” The Hill.com reports. Click for more. This entry was posted in National on October 18, 2017 by admin.